"Gilbert & Gaillard" has rated the wine "2010 Chateau Haut-Marbuzet, Saint-Estephe, France" from the vintage 2010 on 24.04.2011 with 92 of 100 points.
" EN PRIMEUR ? Intense colour with crimson highlights. Concentrated nose intermixing beautiful ripe red fruit with oaked notes. Power and concentration lead the way on the palate yet are fortunately counterbalanced by a welcome exuberance. Excellent quality fruit still obscured by the oak. " "Jeannie Cho Lee" has rated the wine "2010 Chateau Haut-Marbuzet, Saint-Estephe, France" from the vintage 2010 on 01.04.2011 with 90 of 100 points.
" The deep ruby 2010 Haut-Marbuzet has aromas of blackberries, blueberries, cedar, plums and violets, followed by fairly upfront flavours with good mid-palate fruit and a lovely lifted finish. This is a very impressive, classic St Estephe from a property that is making excellent wine and should be better known. Tasted in: Bordeaux, France. Maturity: Young. " "Gault & Millau" has rated the wine "2010 Chateau Haut-Marbuzet, Saint-Estephe, France" from the vintage 2010 on 01.06.2014 with 17 of 20 points. "Vinous Antonio Galloni" has rated the wine "2010 Chateau Haut-Marbuzet, Saint-Estephe, France" from the vintage 2010 on 01.07.2013 with 92 of 100 points. "Jean-Marc Quarin" has rated the wine "2010 Chateau Haut-Marbuzet, Saint-Estephe, France" from the vintage 2010 on 01.02.2012 with 89 of 100 points. "La Revue du Vin de France" has rated the wine "2010 Chateau Haut-Marbuzet, Saint-Estephe, France" from the vintage 2010 on 01.06.2011 with 17 of 20 points. "Vinum Wine Magazine" has rated the wine "2010 Chateau Haut-Marbuzet, Saint-Estephe, France" from the vintage 2010 on 01.06.2011 with 16 of 20 points. "Falstaff Magazin" has rated the wine "2010 Chateau Haut-Marbuzet, Saint-Estephe, France" from the vintage 2010 on 27.05.2011 with 91 - 93 of 100 points. 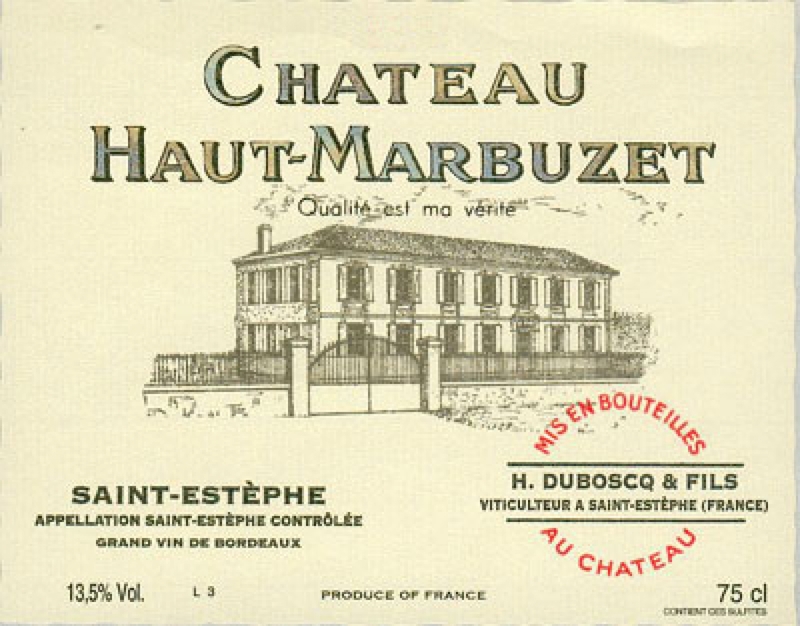 "Jeff Leve, The Wine Cellar Insider" has rated the wine "2010 Chateau Haut-Marbuzet, Saint-Estephe, France" from the vintage 2010 on 19.04.2011 with 88 of 100 points. "Stephen Tanzer" has rated the wine "2010 Chateau Haut-Marbuzet, Saint-Estephe, France" from the vintage 2010 with 92 of 100 points. "CellarTracker" has rated the wine "2010 Chateau Haut-Marbuzet, Saint-Estephe, France" from the vintage 2010 with 90 of 100 points. "Bettane et Desseauve" has rated the wine "2010 Chateau Haut-Marbuzet, Saint-Estephe, France" from the vintage 2010 with 16 of 20 points.